Spectral information (gas, liquid and solid phase from EUV-VUV-UV-Vis-NIR) and related data (e.g. information concerning publications on quantum yield studies or photolysis studies) from published papers. This database is a work in permanent progress (updated weekly). The science-softCon "UV/Vis+ Photochemistry Database" is a non-profit project established in August 2000 and is subdivided into a Literature Service and a Spectra Service. Both database services are operated in accordance to the "Open Access" definitions and regulations of the CSPR Assessment Panel on Scientific Data and Information (International Council for Science, 2004, ICSU Report of the CSPR Assessment Panel on Data and Information. The Literature Service provides spectra data sheets with information concerning publications of EUV-VUV-UV-Vis-NIR spectral data and related information (e.g. quantum yield studies, photolysis studies, etc.). Information provided by our "Literature Service" can be used free-of-charge. However, use of appropriate credits is requested. To add your publication to the "Literature-Service" please send a reprint to helpdesk. 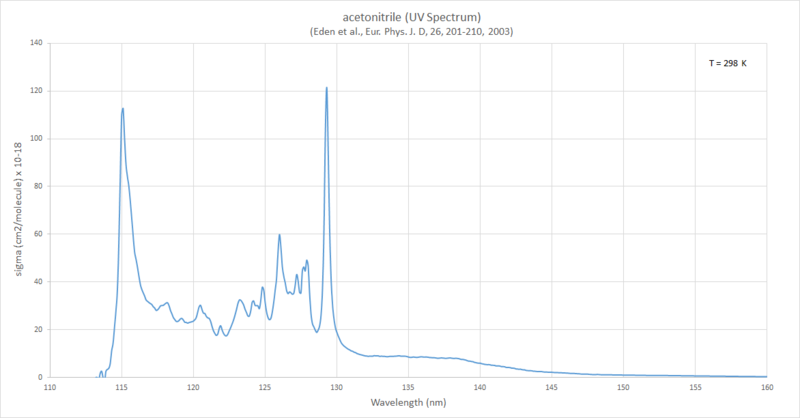 The Spectra Service provides in addition the spectral data (high and low resolution spectra, from low temperatures to high temperatures) in digital form, graphical representations of the spectral data, and additional photochemical information.